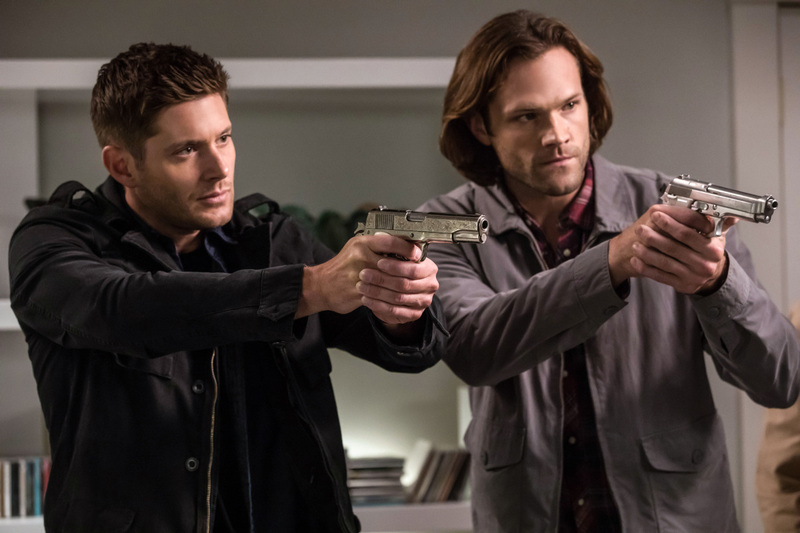 Supernatural 13x04 "The Big Empty"
After last week's somewhat nonsensical-ness, at least this week's episode isn't killing off characters from years past with hardly a glance. Although they are bringing back characters that perhaps should just stay dead already, so... shrug. Yeah, let's just get this out of the way now. Castiel is back on Earth. What a surprise! NOT. After fighting with some goofy being in the big empty, said being decides to grant Cas' wish to go back to Earth because he'll be too annoying otherwise? Okay! Meanwhile, Dean hears about a new case and Sam wants to being Jack along, you know, get out of the house and all that. Dean is still being a big ole jerk about the situation, but reluctantly agrees to it. Before they head out, Jack confronts Sam about being just a tool for him, but when Sam explains that he wants to get back Mary from this hell dimension, Jack is like oh ok, you want to save her. That's okay then. Dean continues to be a jerk to Jack as they start working the case. You know, making him get them food and digging the grave for them. The dirty work, as it were. Basically some people are ending up being killed by what appear to be dead people who were important to them. The Winchesters think it may be a ghost or a revenant, but are all flummoxed when it appears to be neither. It's pretty obvious what it must be if it's not those two things, but whatever guys, play dumb. 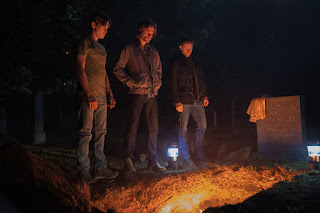 Both of the victims went to the same therapist, so Sam convinces Dean that they should pose as a trio of brothers dealing with the death of their mother, which of course leads to some actual therapy for Sam and Dean. Basically Dean says Sam is delusional by not admitting that Mary is dead, while Sam is pissed that Dean had more of a relationship with Mary, so if she's really dead, he'll never get that. He's so upset that he leaves the room and soon comes to find a pile of... shapeshifter goop! Why yes, what else could be posing as dead people but a shapeshifter? Although I thought they had to actually physically touch the people they were shifting into, but maybe I'm remembering that wrong. Yeah, the therapist is a shifter, but she's not a bad shifter, she's just trying to help people move on by giving them closure with their dead close ones. It turns out, though, that she knows another shifter that may be doing the killing, a former boyfriend of hers. They split up to further investigate, which eventually leads Dean and Jack back to the therapist and Sam off to find the real shifter. 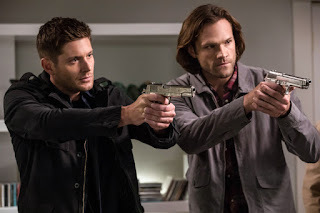 Of course, the real shifter has made his way back to the therapist's house and taken Dean's form, but before that, Jack convinces the therapist to pose as his mother Kelly to give him some of that all important closure. Yada yada, fighting ensues. The shifter seems like he's going to get a shot in at Sam, but Jack manages to finally power up and stop him after some encouragement from Dean. The evil shifter dies thanks to a silver bullet from Sam, and the therapist gets to live on while the brothers take Jack back to the bunker. Dean finally softens up a bit and tells Jack he did a good job, while also telling Sam he needs him to keep the faith about Mary being alive since he has no faith of his own. So, four episodes down and we finally get to move on from that bit of melodrama, it seems. - Soon enough, Cas will be back in the mix, which will change the dynamic again. Will he still have this odd connection to Jack that he had while he was in the womb? Does Cas really have a story here or is this just fan service to bring him back? - I think the show could take a little hint from The Flash and start to get some levity back into the proceedings. My goodness, so much manly angst. - Wondering if there is going to be a typical big bad of this season. 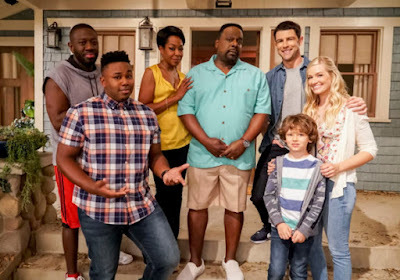 Will it be Lucifer yet again somehow getting back in the picture? I honestly don't want Jack to "go bad" as that would be too cliche, and I do kinda like him. Dean: What, adventures in babysitting the antichrist? Dean: That's right. What gets burned, stays dead. Sam: Dean, he's not our intern. I asked you to keep an eye on him. Dean: I can see him. About Jack, I'm actually thinking he'll die before the end. Maybe relasing those monsters locked in Hell, maybe killed by Lucifer, but I don't think he'll go bad. Cass is probably back because every show needs side characters and all but him are killed off for good, Sheppard has left, and with this being potentially the last season, bringing in new ones isn't really an option. Yeah I agree Jack will probably die by the end, in somehow protecting all of them from Lucifer is my guess.